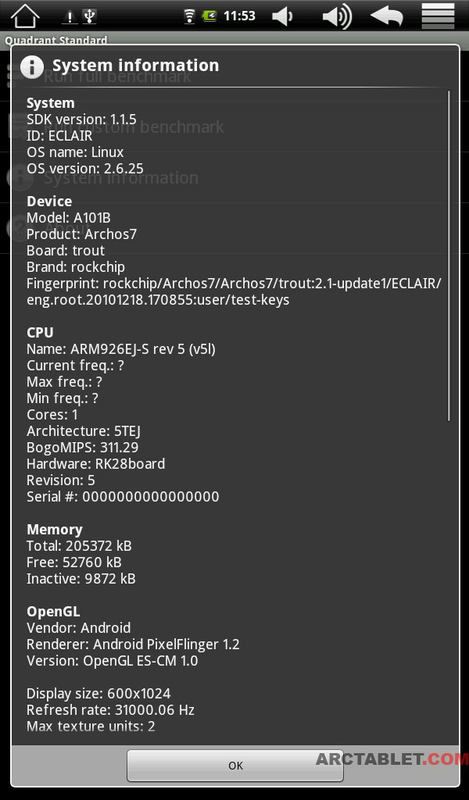 It’s confirmed that the device is running Android 2.1 (Eclair). 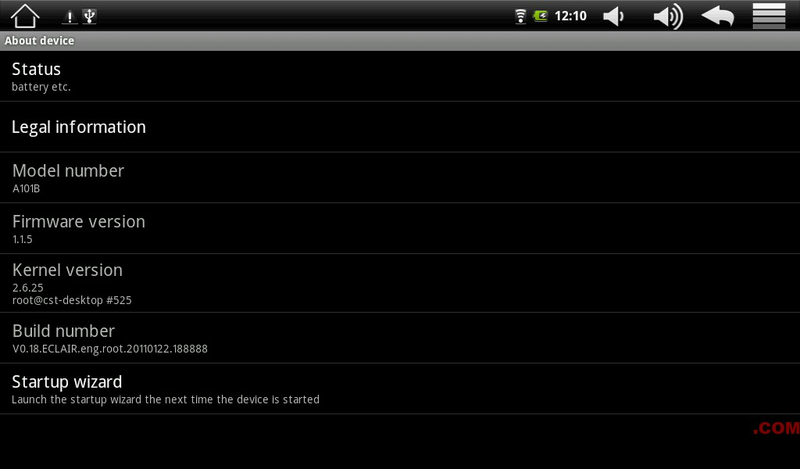 The firmware release is dated 20110122, there is no firmware update for the moment. Actually there is no download in the support section of Arnova website. 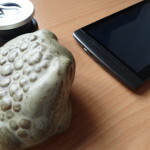 Edit 20th March 2011: a custom firmware for the Arnova 10 is now available, it brings Android Market and root access on the tablet. Internal memory dedicated to the system is 200 MB. 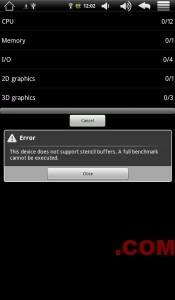 Quadrant Standard version run of full benchmark could not be executed as it gives an error “This device does not support stencil buffers” Reason is probably incomplete OpenGL implementation for this device. 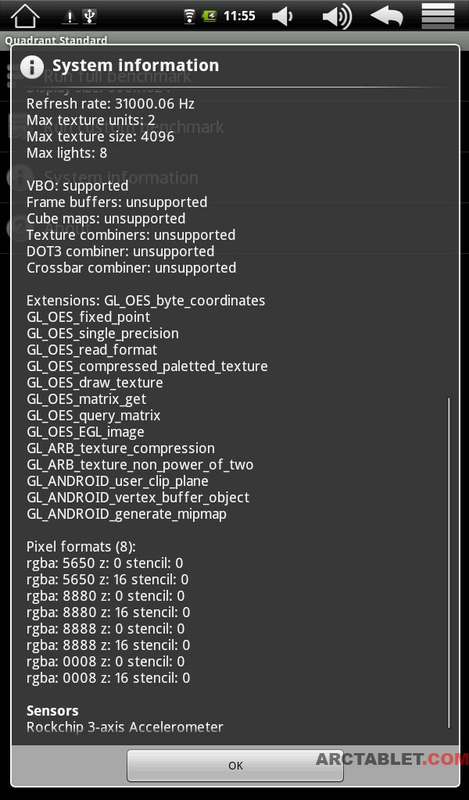 We used the full version Quadrant to get the details, with 3D benchmark disabled. 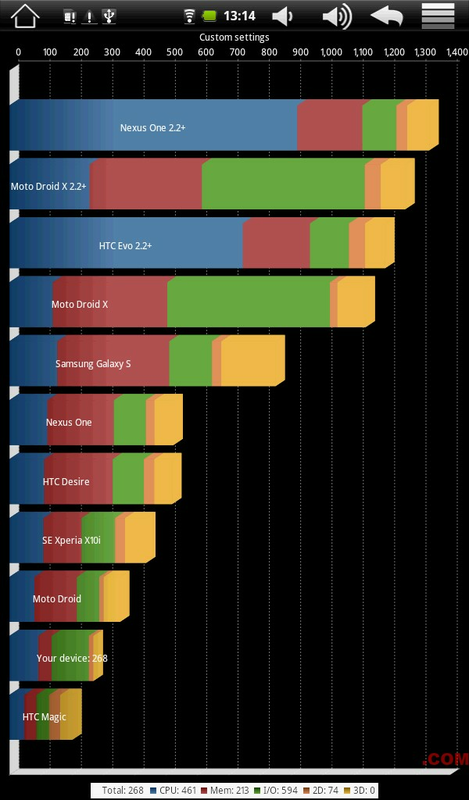 These numbers seem quite low, it’s a bit early to say if it’s the device (CPU) fault or a firmware issue. 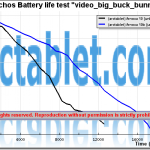 We’ll compare with similar devices to complete this review. 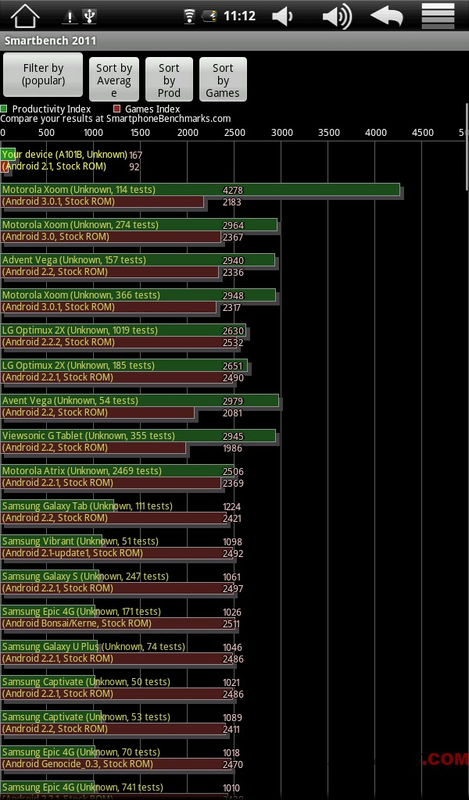 We used ArcTools to benchmark the internal memory read/write speed. We got a relatively disapointing low values of 4457 kB/s (Read), 1859 kB/s (Write), which is in the Class 2 range. 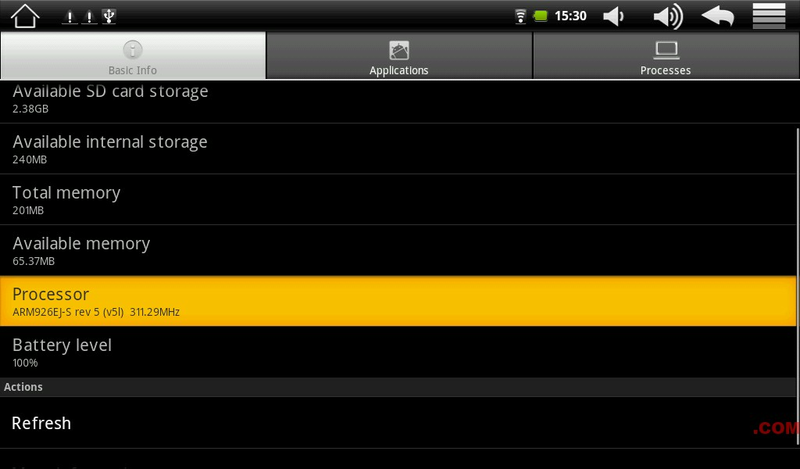 We recommend that you use an external faster SDCard if you plan to do disk intensive operations. 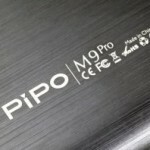 We are currently completing this article, please come back soon for more information and follow our Twitter for more details on the Arnova 10 review. 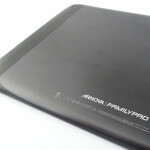 I purchased an Arnova 10 at Comp USA, it was a display model and did not have an instruction booklet. Can I download a copy somehow?? I won’t find much in this manual anyway. Il faut vous tout d’abord installer une application permettant de lire les PDF. Le problème se produit avec tous les PDF ou seulement certains fichiers ? 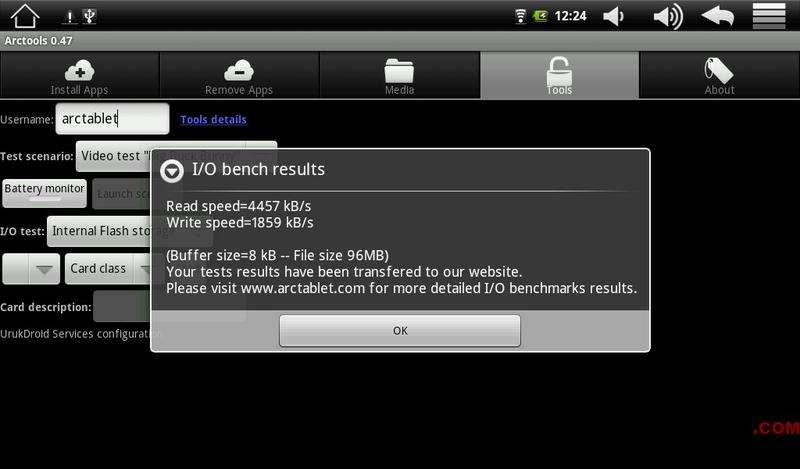 c’est bien qu’arctools fonctionne pour les tests de SDHC. Pour Quadrant, les photos sont révélatrices, j’ai le même résultat que toi ! sur un Arnova 10 8GO, je plus prêt de 290 .